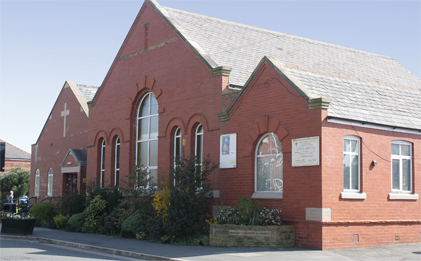 The original Church building was extended in 2005, with the new facilities allowing the Church to be used for a wider variety of activities. The building work also allowed a car park to be created to the side of the building with a ramp being installed to allow wheelchair access. A garden area was designed – this won garden of the year award in 2009. Wifi access is available throughout the Church for all guests, on request. The small car park offers parking spaces for up to 5 vehicles. Additional parking is available on adjacent streets – as we aim to be a good neighbour, we respectfully ask that consideration is given to residents when parking on these streets. There is a small lounge area that can seat up to approximately 12 people. This is used for some small group meetings, such as Take a Break or Bible Studies and can also be used for prayer ministry. The modern kitchen area has full cooking facilities and has been used on occasion to prepare and cook meals for evening entertainment/meetings. It is used each month to prepare breakfast for at least 30 people. The hatch area allows direct service into the hall. A spacious hall area is used for a variety of weekly activities, such as Pramtime and Friday Gang. Drinks are also served in here after the Sunday service, with the hall providing a good space for everyone to chat. The modern worship area is usually set to seat 60 but has on occasion seated in excess of 100! A small music group is located to the rear of the worship area and plays most Sundays. Worship is led from the front by a worship leader and preacher. Worship is supported by a modern media system, including projector, loop system and microphones. Hymn books are available for those prefer to use these – large print versions are also available. Bibles are located under some of the seats in the worship area for people to access as required. The majority of the songs used during worship are from Songs of Fellowship books 1-4 or the Complete Mission Praise. The music is a combination of modern worship songs and traditional hymns, with an emphasis being placed on variety and creativity amongst the worship leaders and musicians. There is a small collection of Christian books available for borrowing free of charge. These are stored in the lounge area and can be made available upon request. Please see our "The Building" gallery in the "Media & Downloads" section to see the facilities we have available.